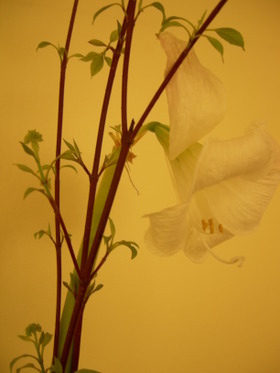 The cornus stems (right) which I used to prop up the top heavy amaryllis have set leaf. Just shows how easy it is to propogate some plants. All I did was spring prune them and place them in the potting soil. In a few weeks they'd taken. 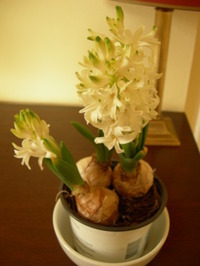 Fragrance during the week was provided by this hyacinth (below left) a present a couple of weeks ago from a writer friend who came to help bathe the dogs. She's working on a book and wanted the experience so she could write about it. We were only too happy to oblige with that chore. Anyone writing about dish washing, household cleaning, ironing or lawn mowing? We are happy to oblige. Please form an orderly queue. It will be a week since my last visit to the allotment and I'll probably have to fix the netting on the cages and clear up debris since the storms we had at the start of the week. Fingers crossed there's nothing else. Beautiful images. Great work. Thanks.